14 pt. 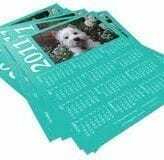 UV coated Full Color 8.5×11″ flat-8.5×4 Folded Tent Calender. Great calendar for mailers.